Seattle's median house price in February posted its first year-to-year gain since October 2010, according to a report released Monday. The median price in February was $365,000, up 2.8 percent from February 2011 and 4.1 percent from January 2012, the Northwest Multiple Listing Service reported. King County's median, $308,125, was down 7.75 percent from a year earlier and 2.2 percent from the prior month. "I think that's a reflection of the marketplace looking for convenience, particularly in light of the increase in gas prices and probably to some extent the tolls on 520 as well," said Glenn Crellin, associate director of the Runstad Center for Real Estate Studies at the University of Washington. What can one read into Seattle's increase, seeing as prices were down by 10.1 percent year-over-year in January? 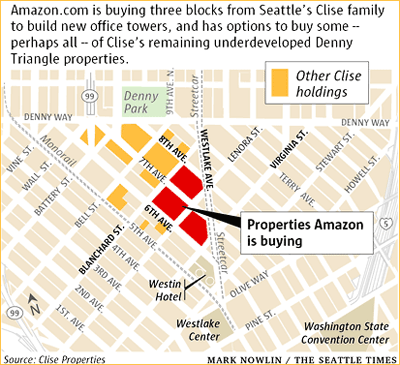 "I think it really is a market that's trying to figure out exactly where it belongs, what normal looks like," Crellin said, noting that there's wide variation in price changes by area in and around Seattle. "It's very much a neighborhood-specific kind of thing." Sales of houses and condos were up 10.2 percent from a year earlier in Seattle and 26.5 percent countywide. Pending sales, which don't all close but can be a better indicator of the most recent activity, were up 21.9 percent and 28 percent, respectively. Job growth and historic low interest rates are actually creating a seller's market through the mid-price ranges and contributing to surging sales near job centers, J. Lennox Scott, CEO and chairman of John L. Scott Real Estate, said in a listing service news release. "It's a special moment in time in real estate history. We have a backlog of qualified buyers looking for homes to purchase." Inventory continues to be low, with 3.9 months worth of homes for sale at the current sales pace in Seattle and 4.5 months of inventory countywide, down from 6.9 months and 8.4 months, respectively, in February 2010. In previous months, however, low inventory had not translated to price increases, largely because many of the homes for sale are in or under threat of foreclosure. Such homes tend to sell for big discounts. "The only thing tempering this from being a hot, thriving market are the short sales and foreclosed properties which represent about one-third of the transactions," Frank Wilson, branch managing broker at John L. Scott Real Estate in Poulsbo, said in the listing service release. Referring to homes under threat of foreclosure, Crellin said: "I'm still very concerned about the overhang of distressed properties we still have to work through." Condos were a bit of a different story from houses in February. The median sales price was $202,000 in Seattle and $159,950 countywide. That was down 35.4 percent in the city and 27.1 percent countywide from a year earlier, but up 2.9 percent and 8.6 percent, respectively, from January. This is the 15th issue of The View from the Street. When I began this series of three cheers for Seat­tle I knew that the first cheer would be for “scenery” and the sec­ond for “smarts,” two aspects of Seat­tle that are firmly estab­lished. I planned the third cheer to be about sil­ver lin­ings, a much less sure thing, given the vagaries of the polit­i­cal and eco­nomic land­scape. I’m happy to report that the clouds that made Seat­tle area real estate val­ues go down the drain now have sil­ver linings. This just in: accord­ing to the North­west Mul­ti­ple List­ing Ser­vice (NWLS), Seattle’s median house price in Feb­ru­ary posted its first year-to-year gain since Octo­ber 2010. “Job growth and his­toric low inter­est rates are actu­ally cre­at­ing a seller’s mar­ket through the mid-price ranges and con­tribut­ing to surg­ing sales near job cen­ters…” a senior real estate exec­u­tive asserted. Read more here about this sil­ver lin­ing story from the Seat­tle Post-Intelligencer. “Falling prices and a scarcity of new build­ings are help­ing fuel home sales in the Seattle-Bellevue region, with condo trans­ac­tions ris­ing seven times faster than the aver­age of 20 large met­ro­pol­i­tan areas in the U.S.” So says a Busi­ness Week story from Feb­ru­ary 29, 2012. Even builders of new homes have an opti­mistic out­look of Seat­tle area real estate. Two national home builders, the Pulte Group and and Toll Broth­ers have made for­ays into the Seat­tle mar­ket. Pulte did so in Feb­ru­ary of 2011 by pur­chas­ing prop­erty in the Issaquah High­lands, Red­mond Ridge and Maple Val­ley. The Toll Broth­ers’ entry in the Seat­tle area real estate mar­ket was the acqui­si­tion of CamWest Devel­op­ment. This was Toll’s first expan­sion in to a new state since 2005. On the com­mer­cial side of real estate, Seat­tle made national news in Feb­ru­ary. Ama­zon is buy­ing three large con­tigu­ous blocks in cen­tral Seat­tle from Clise Prop­er­ties and plans to build a 1 million-square-foot office tower on each. Here’s how The Wall Street Jour­nal reported the news and here’s how The Seat­tle Times cov­ered the story. This will change the land­scape between cen­tral down­town Seat­tle (Denny Tri­an­gle) and the Lake Union area where Ama­zon already occu­pies sev­eral new buildings. To round out the sil­ver lin­ings, there is renewed hope that the game of hoops may be on its way back to Seat­tle. In my mind, a com­plete Amer­i­can city has a base­ball, foot­ball and bas­ket­ball team. So per­haps Seat­tle will be made whole again. Hav­ing become a mecca for soc­cer, the return of bas­ket­ball to Seat­tle would add yet another attrac­tion to one of America’s most scenic and smart cities. About a week ago I received a phone call from Munich where I used to live for a while. The Ger­man gen­tle­man asked for my help in find­ing some land in the Pacific North­west. This is to be a longer term invest­ment for him and poten­tially for his son with no plans to build in the fore­see­able future. I asked him why not Florida, so much closer and pop­u­lar with Ger­mans. “It’s too hot there,” he replied and added that this area of the United States is one he has come to love after sev­eral vis­its. He likes the scenery and the prox­im­ity to moun­tains and ocean.